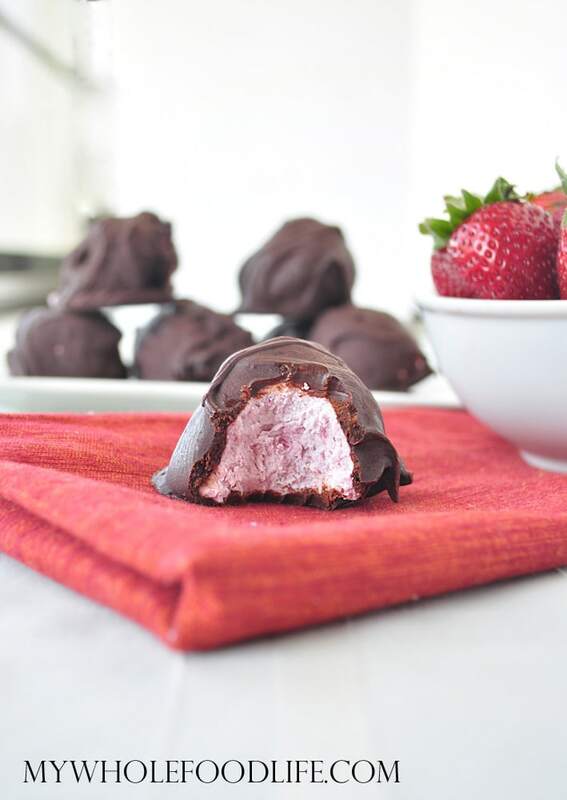 These Strawberry Creme Truffles need to go on your must make list! Who is excited that Spring is finally here? I just love all berries and I am happy that I am starting to see them in the grocery store now. I picked up a carton of organic strawberries the other day and I came up with these delicious strawberry creme truffles. They are amazing and the filling just melts in your mouth! You may also like my Pistachio Truffles or my Copycat Reese’s Peanut Butter Eggs. These dreamy, creamy truffles would also make a great Easter treat! Truffles are very easy to make. These healthy truffles fit just about every diet. They are vegan, gluten free, grain free and paleo friendly. These also freeze well, so you can keep yourself stocked up when a sweet craving hits. Or when you want the taste of berries in the middle of winter. In a food processor , mix the filling ingredients together very well. Using a cookie scoop or a spoon, drop small balls of the filling onto a lined baking sheet . If the filling seems to soft, stick it in the fridge for 15 minutes. Hello: Could you please tell me what to use instead of Coconut Butter? My daughter is allergic to coconut. Also, how long will these keep in the freezer? Can she have cashews? A cashew cream may work well too. They should keep in the freezer for several months. I am a food lover and After seeing this recipe, automatically a sweet smile appeared on my face! This is really a delicious recipe. I am planning it to prepare it shortly so wants to know how long it can be kept in freezer? It can be kept in the freezer for several weeks. My mix will not firm up even though I added extra coconut butter. I can't make balls. I have refrigerated or for 3 days. & it still is loose. What can I add? I doubled the recipe. Sorry that happened. Doubling the recipe was probably the issue. The extra strawberries probably added too much moisture. You can try freezing them. These whip up super quick (and look so tasty it's hard to wait for them to set to try them out :) I used 3 ingredient chocolate recipe(added a pinch of salt and 1/2 tsp vanilla), and it's perfect, no need to buy chocolate chips at all. Adding the milk made the chocolate blend together beautifully for dipping. Thanks for this tasty healthy recipe! What could you use instead of coconut butter or cashew butter? My niece is allergic to both coconut and nuts. It doesn't have to be vegan though. Maybe cream cheese? You may have to add extra sweetener, though.